Speaking of AirPlay receiver, the first media streamer appears on your radar might be Apple TV. 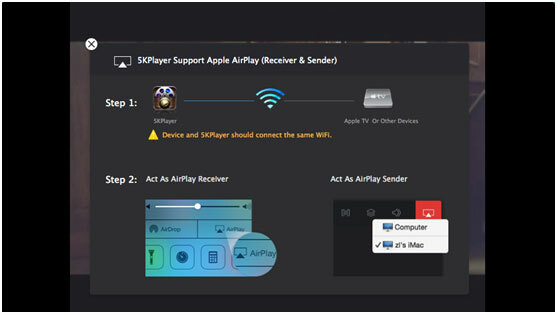 But now you will know another better AirPlay receiver-5KPlayer, which enables you to stream video (SD & HD) music (MP3, FLAC, AAC, AC3, WMA) from iPhone XS/XS Max/XR/X/8/7/SE/6/6 Plus; iPad Pro/mini 3/Air 2 to iMac/MacBook Air/Pro without any dent in your wallet. And moreover, this top-ranking AirPlay receiver acts as a reliable AirPlay sender to stream video audio from Mac (OS X/OS Sierra/ OS Mojave) to Apple TV, as well. You need DearMob 5KPlayer, the highly sought-after AirPlay receiver to reach your goal since this top free AirPlay receiver aids you to stream media files from iOS 12/11/10 devices to Mac with greatest of ease and zero hurdle. Apple TV replacement field has become a crowed one these days and several Apple TV alternatives appear to stimulate your interests, like Chromecast, Roku, Amazon Fire TV and Google Nexus Player, etc. All these four media streamers are not only the streaming boxes in the market, but they all have a high profile in the globe and for good reason- they are all priced under $100, marginally cheaper than Apple TV. Beyond question, these four media center software beat the pants off Apple TV in price, but all of them are actually tweedledum and tweedledee in functionality, since they all have their respective pros and cons. See, Apple TV is an awesome iOS companion but with fewer apps and features than others; Chromecast has an edge in lower price, smaller size and simplicity, but becomes overshadowed with no true TV interface or remote. And Roku earns a wide wave of popularity due to more choice of devices and apps, yet imperfect because of weak mirroring and gaming. In such case, you might doubt whether there is one being cheaper and better than Apple TV? AirPlay Video Receiver, AirPlay Audio Receiver, Free Two-in-One, Who Can Be? The answer is absolutely YES! The new throne of media player called 5KPlayer developed by DearMob is the one you are chasing for, which is downright free for you to AirPlay any video yet music from iPhone XS/XS Max/XR/X/8/7/SE/6/6 Plus/SE/5s, iPad Pro/mini 4/3/Air 2, iPod Touch to Mac (Mojave/High Sierra) at your finger. With this wireless video audio receiver in hand, you are the dominator to stream videos music from iOS devices to Mac, irrespective of the hot Disney movie soundtracks or top vevo music videos formatted with 4K UHD, MP4, MKV, AVI, MP3, AAC, or FLAC, etc. How to Stream Video from iPhone iPad to Mac with AirPlay Receiver? Download 5KPlayer for Windows or Mac, install and launch it. This sensitive AirPlay condition guard can seamlessly adapt to your macOS High Sierra or Windows 10 to solve AirPlay not working. Here we first focus on troubleshooting Apple TV AirPlay. You could also turn to full passage on how to use AirPlay for guide on AirPlay for Windows, AirPlay from iPad to PC, or from iPhone iPad to Mac.. Step 1: Free download and launch this best-ever AirPlay receiver on Mac and click AirPlay on the interface to enable its AirPlay streaming functionality. Step 2: Open the video or music you wanna stream to Mac. Find out the AirPlay button on your iPhone iPad devices, and then gently tap AirPlay. And the video or music on your iOS devices would be played on Mac screen immediately. Step 3: Select the Mac computer you are ravenous to play video music thereon from the popping-up device list. After this, you can eventually start to stream video audio from iPhone iPad to Mac and watch media files on the bigger sharper screen. Not only acting as a solid AirPlay audio video receiver, this all-in-one media streamer is also a well-designed video music downloader for media buffs to download YouTube videos, Facebook videos, VEVO music and more from 300+ video music sharing sites. Better still, you are also allowed to stream video music from iPhone iPad to Mac or from computer to Apple TV to gain better audio-visual enjoyment. Wonder how to stream videos from Mac to Apple TV with original quality? To stream movies from Mac to Apple TV. How to AirPlay OS X?